(CNN) -- Team Columbia's Greg Henderson scored a surprise victory in the third stage of the Tour of Spain on Monday as he won a bunch sprint in Venlo. 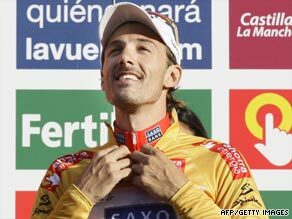 Cancellara has retained the gold jersey of Vuelta leader for the third day. The New Zealander is the lead-out man for the team's number one sprinter in the race, German Andre Greipel, but coming off a difficult final bend in the Dutch town, he found himself in winning position. The 32-year-old former world track champion duly crossed the line ahead of Slovenia's Borut Bozic and Spain's former three-time world champion Oscar Freire. Other sprint favorites, Tom Boonen of Belgium and Tyler Farrar of the United Stages also finished outside the podium positions. It followed 189.7km of racing over generally flat terrain from Zutphen, with an early breakaway pulled back to set up the expected bunch finish. Switzerland's Fabian Cancellara, from the Saxo Bank team, retained the race leader's golden jersey after his victory in the opening prologue on Saturday. He has a six second advantage over Henderson with German sprinter Gerald Ciolek, the winner of Sunday's second stage, in third place at eight seconds. Victory for Henderson, who has won stages of the Tour of Georgia and Tour de Catalunya, continued Team Columbia's successful season. Their star sprinter, Mark Cavendish of Britain, who claimed six stages of the Tour de France, is not racing in Spain, opting instead for the Tour of Britain. The three-week Vuelta continues in the low countries on Tuesday, but with a finish in Liege in Belgium the tougher terrain could see many of the overall contenders show their hand. With Tour de France champion Albero Contador not racing his home tour and Astana teammate Lance Armstrong also absent, the race is wide open, with Spaniard Alejandro Valverde (Caisse d'Epargne) the marginal favorite. Kazakhstan's Alexander Vinokourov is returning to the peloton after a two-year doping suspension.